This unsweetened bread can be sliced and enjoyed much like many other bread. Because it lacks gluten and doesn't contain yeast, it has a different texture and taste than wheat breads. This recipe can be doubled for a larger loaf, or divided into 2 smaller loaf pans for a nice tea bread. Preheat oven to 350 degrees F. In a medium-sized bowl mix eggs, ghee*, honey and sea salt until well-blended. Combine sifted coconut flour and baking powder, and whisk them slowly into the batter until no lumps remain. Spoon the batter into a small greased loaf pan (9x5x3 or smaller). Bake for about 40 minutes. Remove from pan and cool on rack. Preheat over to 340 degrees and line a glass loaf pan with baking paper. ( I use a little coconut oil to help the paper stick to the tin ) Grate pumpkin using hand held grater or food processor with the grater attachment and place in a bowl with almond flour, hazelnut flour, baking powder, Celtic salt and mix until combined. In a separate bowl mix eggs and olive oil or ghee together, once incorporated add to the pumpkin mix and stirring till all incorporated. 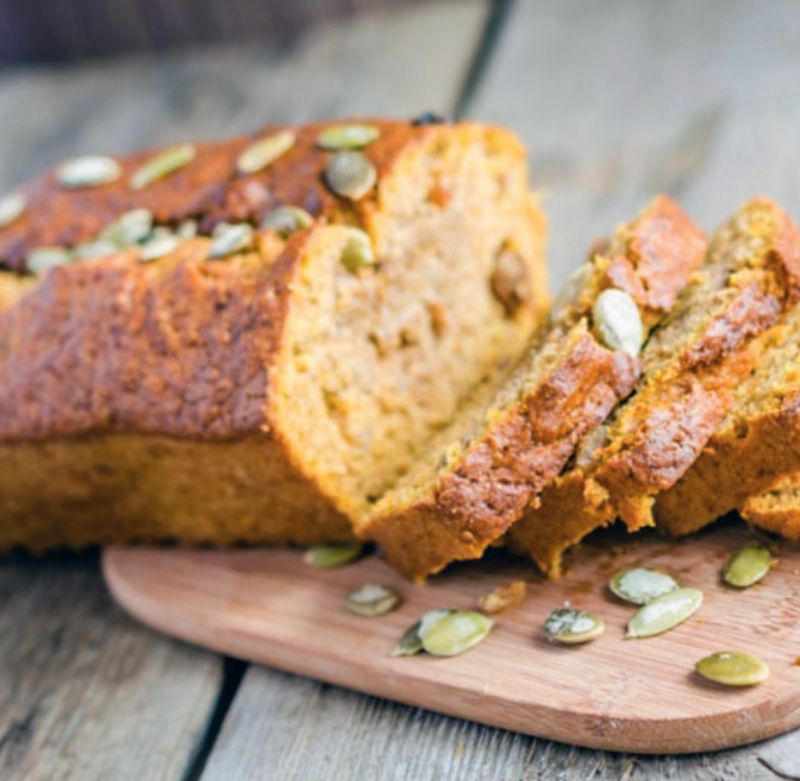 Spoon mixture into prepared loaf pan and sprinkle with pumpkin and nigella seeds. Place in the oven for 1 hour. Check with a skewer and if the skewer comes out clean it's cooked if it's not then place back in the oven and cook for another 15 min and then check ( it can take an 1 hour 30 min to cook depending on ovens so don't stress if it takes longer ) allow to rest for 30 min. Place in fridge if not eat the day of. For the whipped chili butter place butter in kitchen aid with paddle attachment or a food processor. Whip till fluffy place in a bowl and add a pinch of chili flakes ( or more if you like it hot) and salt if needed and fold in with a spatula. You can keep at room temperature or place in the fridge. Kale, spinach, broccoli, mushrooms, carrots etc. 1. Bring the broth to a boil, add zucchini noodles and cook for 2-3 minutes until tender. Scoop noodles out and place into a soup bowl. 2. Add the mixed veggies into the broth and cook on medium low heat for 2-3 minutes until veggies are tender.